Spaniards are the most receptive among Europeans to the arrival of refugees from war-torn countries, according to results of a recent global survey of attitudes toward refugees just released by the Pew Research Center in Washington, D.C. According to the Pew survey, 86 percent of Spaniards said they support taking in refugees from countries where people are fleeing violence in war, a result that is in line with the more open attitude toward refugees adopted by the new Socialist government of Spanish President Pedro Sánchez. 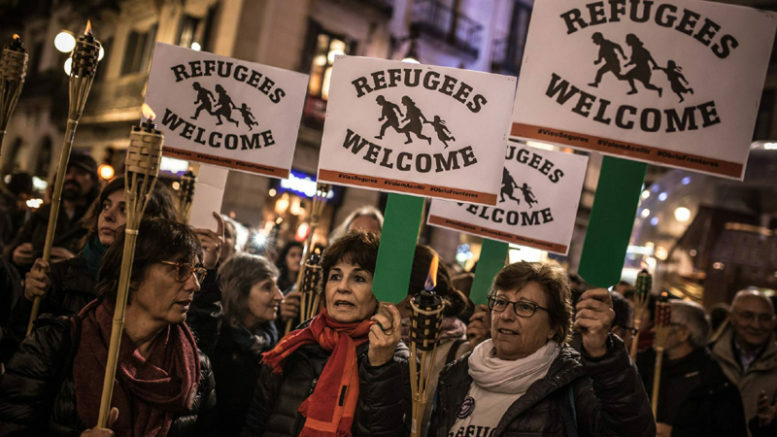 The Pew survey result also confirms results of a separate public opinion poll released by the EU’s European Council in June showing that 83 percent of Spaniards feel their government should act to take in refugees from war-torn countries. Conducted in the Spring of 2018 among citizens of 10 European and eight non-European countries, the Pew survey also showed that attitudes in favor of welcoming refugees remains relatively high across most of western Europe. But, survey results also show that many Europeans are not happy with the way the European Union has handled the refugee issue since the crisis began in Europe in 2015. That, say some analysts, suggests that the rise of nationalist movements with anti-immigrant rhetoric in several European countries may be due less to widespread “nativist” anti-immigrant attitudes that the result of public discontent with mismanagement of the refugee situation by the EU bureaucracy and governments. According to the Pew Survey, 82 percent of Dutch citizens, 82 percent of Germans and 81 percent of Swedes surveyed said they favored their countries taking in refugees fleeing violence and war in their countries, while 79 percent of French and 74 percent of UK respondents said the same. Disapproval of the way in which the EU has handled the refugee situation is highest in those countries which have seen the rise of far-right and anti-immigrant movements. According to the survey, 92 percent of Greeks disapproved of the EU’s handling of the refugee situation, followed by 84 percent of Swedes, 80 percent of Hungarians and 78 percent of Italian respondents.